The research approach comprises three main elements, namely, beach monitoring, field experiments and numerical modelling. 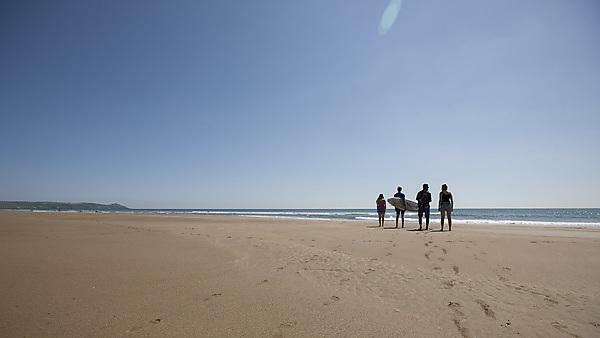 Considerable emphasis will be placed on assessing the implications of the research for beach safety and tools will be developed to assist the RNLI with their lifeguarding duties. Preliminary results from beach surveys conducted as part of WHISSP suggest that the beach morphology is highly variable along the north Cornish coast with well developed bar/rip systems present in summer, but a largely featureless beach or very subdued bar/rip morphology in winter (Poate et al., 2009; weeks-to-months time scale). 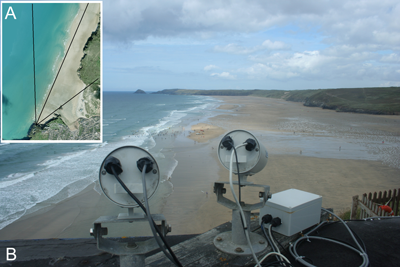 This work will be extended in DRIBS through monthly topographic and bathymetric 3D surveys of two key beaches on the north Cornish coast (Porthtowan, Perranporth), complemented by analysis of ARGUS video data already collected at the same locations (Figure 3). The beach surveys will provide the best spatial resolution of the changing intertidal morphology, allowing determination of the bar prominence, rip dimensions and location, and beach sediment volumes (Figure 4). 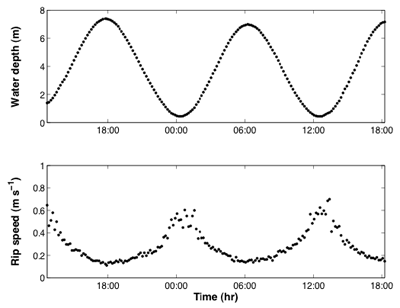 The ARGUS data will provide the best temporal resolution by providing daily representations of the intertidal topography and wave breaking patterns (refer to Figure 1). Figure 3. ARGUS video camera system at Perranporth. The camera system will be modified for the DRIBS project to include a third zoom camera providing greater resolution across the expected study region. Figure 4. 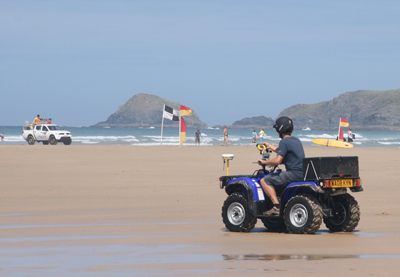 Monthly topographic beach surveys will be conducted by the DRIBS project team at the University of Plymouth using an ATV mounted RTK-GPS system. We will conduct a 6-week field campaign on two high-wave, large-tidal beaches along the north Cornish coast where mass rescue events of upwards of 150 people per beach have required simultaneous rescue due to rip currents. During each of these campaigns, we will install several instruments in the surf zone that will measure waves, tides and rip currents at fixed locations. In addition, we will use a large number of specialist drifters that measure the complete rip current pattern. The drifters will be released in the surf zone and will move according to the nearshore current pattern. Their location will be continuously monitored (using GPS) and the data from the drifters will provide useful information not only on the strength of the rip current, but also on the type of flow pattern. The drifters are designed to behave like human beings and their movement therefore mimics that of passive bathers. Regular inter- and sub-tidal bathymetry collected by RTK-GPS and echo sounder surveys. Spatial patterns of wave energy dissipation, and radiation stress and water surface elevation gradients across the sub- and intertidal bar morphology. the rip and feeder channels and over the surrounding bars. Lagrangian sub-surface drift across the cell circulation system using GPS-tracked drifters (Figure 6). Seaward boundary conditions to force surf zone circulation models. Figure 6. 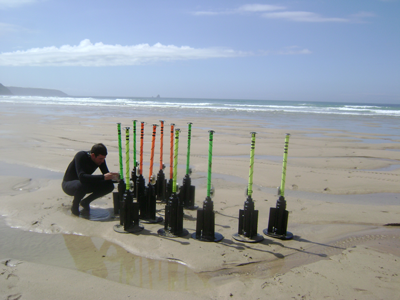 GPS drifters used to measure Lagrangian flow field of the rip current investigated during the MATRIX pilot experiment at Perranporth beach. This is the first time such comprehensive measurements will be made in a macro-tidal setting. Experiment timings (early and late summer) have been selected to make sure that the rip morphology during the experiments will be significantly different (weeks-to-months time scale), whilst the duration of the field deployments will ensure sufficient variability in wave conditions (daily time scale). The key aspect of the field experiments is that due to the large tidal range (> 6 m), the forcing of the cell circulation system will vary considerably over a single tidal cycle, with rip currents being ‘turned on and off’ depending on the tidal stage (hourly time scale; refer to Figure 7). Figure 7. Tidal modulation of rip current velocity during MATRIX pilot study. The strongest rip flows (> 0.6 m/s) prevail around low tide when wave breaking occurs over the nearshore bars. This will enable us to test our leading hypothesis by pinpointing exactly under what conditions the rip current system is at its strongest. The combination of Eulerian and Lagrangian flow measurements will also help investigate offshore-directed squirts, which may be related to rip pulsing (minute time scale). The exposure of most of the bar/rip morphology at spring low tide will enable installation, maintenance and surveying-in of the instrumentation with relative ease and will further ensure accurate morphology data. The work in DRIBS will be underpinned by numerical modelling throughout all phases of the work and will be supported by the Visiting Researchers (Prof Dano Roelvink and Dr Ap van Dongeren). The key numerical tool to be used is XBeach, a recently developed, process-based public-domain model that is capable of resolving the hydrodynamic processes most relevant to rip current dynamics (e.g., wave shoaling, refraction and energy dissipation, wave-current interaction; longshore and rip current velocities, infragravity wave motion and tidal translation; Roelvink et al., in press). XBeach will be used to plan and optimise the instrument deployment during the field experiments by running the model prior to the field experiments using actual bathymetry and expected wave/tide conditions. After the field experiments, XBeach will be validated and calibrated using the field data and the model will be implemented to help identify the most important processes in driving the rip circulation through comparison between field data and model results obtained using different model parameters and settings. XBeach will also be used to run scenario type simulations over individual tidal cycles using idealised beach morphology (e.g., subdued bar, pronounced bar, low-­tide bar, mid-­tide bar, etc) and varying wave/tide conditions to identify when and under what conditions rip currents are particularly strong and also what the character of the rip circulation is. The model output will be condensed to provide a simple diagnostic look-up-type tool (e.g., set of charts/tables) for daily use by beach lifeguards based on prevailing conditions. The project also aim to develop innovative data-model assimilation tools to develop a decision-support system (DSS) with which rip current hazards and associated risk can be predicted several days in advance. Rip risk predictions developed in DRIBS will be based on a fully validated model outputs and bathymetry, and will cover several rip systems (Figure 1). Such information contributes significantly to planning and operational aspects of RNLI lifeguarding activities.